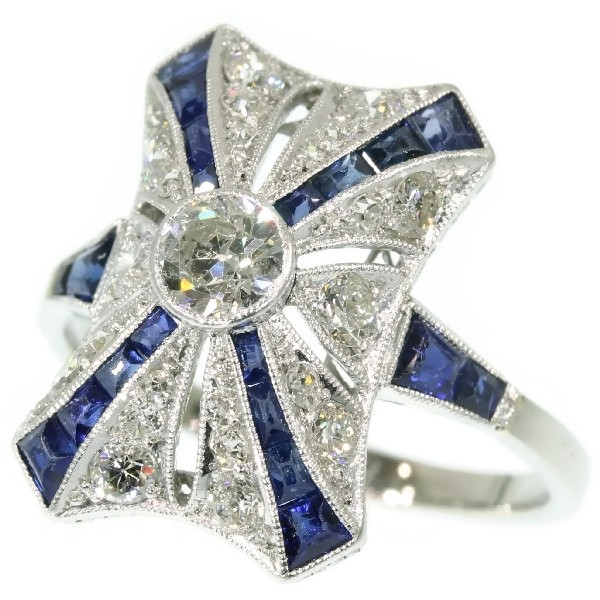 Marvelous Art Deco Belle Epoque antique engagement ring diamonds and sapphires: Description by Adin Antique Jewelry. Every now and than we find a jewel that we like even more than our other antique jewelry. And such is the case with this ring. Take a look at the pictures! Not only the top part of this ring is out of the ordinary but take a look at the inside of it too. The artist who made this ring definitely took pride in his job. We just let the pictures speak for themselves. Diamonds: One old brilliant cut diamond with an estimated weight of approx. 0.25 crt. and 22 old mine brilliant cut diamonds with a total estimated weight of approx. 0.80 crt. Precious stones: 20 sapphires . We did not check if the sapphires are lab produced or not as this information has no influence on the value of this jewel. Natural sapphires and lab produced sapphires were both used in this era, rather more for their effect than for their intrinsic value.